Sensor News Releases by Ocean Sensor Systems, Inc. Please see some of our news releases for information on how our Wave Staffs and other Products are being used in the industry. 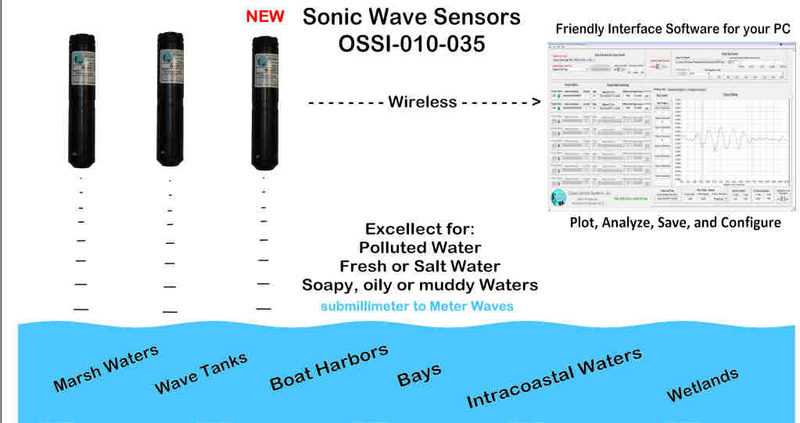 March 2018 - Updated Staff & Sonic Prouucts Interface Program - Ocean Sensor Systems releases updated to Staff &Sonic Interface Program. Ver2.40 Two new features:: 1) New File Interval added to Save Output Data To File. 2) Stream Output to Com Port. Same format as Save Output to File format. 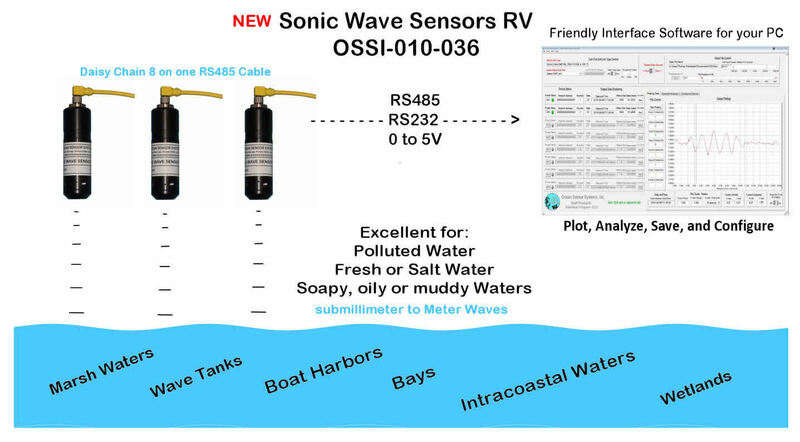 May 2016 - Updated Staff & Sonic Prouucts Interface Program - Ocean Sensor Systems releases updated to Staff &Sonic Interface Program for new Sonic Wave Sensor RV. Ver2.32 updated for Sonic Wave Sensor RV OSSI-010-036. May 2016 - New Sonic Wave Sensor RV - Ocean Sensor Systems releases new product 5-22-2016. The OSSI-010-036 Sonic Wave Sensor RV is a water level sensor that combines a rugged IP67 resistant to water submersion package, low power microprocessor and Anti-aliasing sensing circuit. The Sonic Wave Sensor RV has a range of 2.5 meters. See Sheet 2 Wave Performance for limitations. It is powered with any external voltage from 4.5 volts to 45 volts. There are 3 versions with different signal outputs. The OSSI-010-036-2 has a RS485 output and a 0-5V analog output. The OSSI-010-036-2 has a RS232 output and a 0-5V analog output. The OSSI-010-036-3 has a RS485 output. Laptops and PCs can easily receive the Sonic Wave Sensor RV’s data using the RS232 or RS485 to USB Adaptors that are supplied. Time stamped data can be used to synchronize up to 8 Sonic Wave Sensor RVs. The Staff & Sonic Product Interface Program is available to down load from our web site to configure, display, analyze and store the sensor data. September 2015 - Updated Ocean Measuring Software - Ocean Sensor Systems releases updated Interface Software for all Staff and Sonic Type Products. Ver2.3 updated for Sonic Wave Sensor XB OSSI-010-035. September 2015 - New Ultrasonic Wave Measuring Instrument - Ocean Sensor Systems releases new product 9-1-2015. The OSSI010-035 Sonic Wave Sensor XB is a water level sensor that combines a rugged, IP67 resistant to water submersion package, Xbee RF Module, low power microprocessor and Anti-aliasing sensing circuit. It will provide months of operation with two industry standard C size alkaline batteries. Sonic Wave Sensor XB has a range of 2.5 meters. 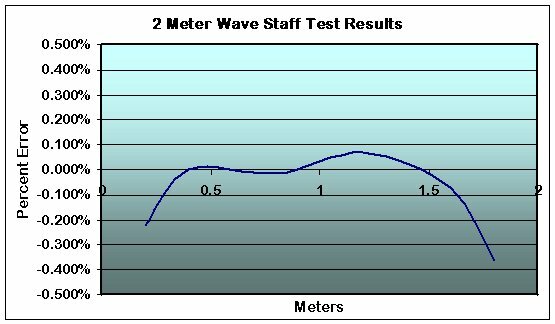 See Sheet 2 Wave Performance for limitations. Laptops and PCs can easily receive the Sonic Wave Sensor XB's data with any one of several optional Wireless Adaptors. Time stamped data can be used to synchronize up to 8 Sonic Wave Sensor XBs or Wave Staff XBs. A new, easy to use, PC Staff Product Interface Program is available to down load from our web site to configure, display, analyze and store the sensor data. January 2015 - New Ocean Measuring Software - Ocean Sensor Systems releases new Interface Software for all Staff Type Products. June 2014 - New Ocean Measuring Instrument - Ocean Sensor Systems releases new product 6-1-2014. The Wave Staff XB is a A Wireless Wave Staff with Synchronized Sampling and Self-Grounding Coaxial Staffs. The OSSI010-025 Wave Staff XB is a water level sensor that combines a rugged, IP67 resistant to water submersion package, Xbee RF Module, low power microprocessor and Anti-aliasing sensing circuit. Months of operation with two Industry standard C size alkaline batteries. Sensor Staffs from 0.5 meters long to 20 meters long. The self-grounding Coaxial Rod and Cable Staffs eliminate the need for a separate water ground wire. Laptops and PCs can easily receive the Wave Staff XB’s data with any one of several optional wireless Adaptors. Time stamped data can be used to synchronize up to 8 Wave Staff XBs. A new, easy to use, PC Interface Program is available to down load from our web site to configure, display, analyze and store the sensor data. January 2013 - New Ocean Measuring Instrument - Ocean Sensor Systems releases new product 1-25-13. PC Interface Software to Configure, Monitor and Display Raw & Processed Data. January 2013 - New Ocean Measuring Software - Ocean Sensor Systems releases new Interface Software for Wave Gauge Blue. 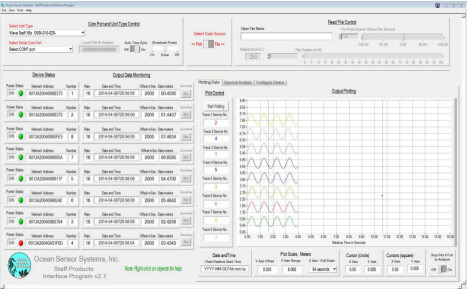 The Wave Gauge interface software is available from Ocean Sensor Systems and contains all of the features necessary to, configure, monitor and display raw and processed wave data or upload small test files. It will run on most Windows based machines. The free Interface Program is available to downloaded and install on a PC from the Ocean Sensor Systems Web Site. November 2007 - New Ocean Measuring Instrument - Ocean Sensor Systems releases new product 10-9-07. Wave Staff Synchronizers: OSSI-012-012C The OSSI-012-012C is specially designed to initiate the Wave Staffs to take synchronous samples of 2 to 6 staffs and combine the results to a single RS232 data stream at 38.4K baud. There is no need to pre-configure the Wave Staffs as they are automatically configured by the Synchronizer at power up time. Two or three Synchronizers may be linked together to simultaneously sample up to 12 to 18 Wave Staffs. The Synchronizers may be configured to free run or sample on command. The enclosure is a NEMA 4X type box..
October 2007 - New Ocean Measuring Instrument - Ocean Sensor Systems releases new product 10-9-07. The OSSI-012-012 and OSSI-012-012C are designed to take synchronous samples from 2 to 6 Wave Staffs and combine the results to a single RS232 data stream at 38.4K baud. There is no need to pre-configure the Wave Staffs as they are automatically configured by the Synchronizers at power up time. Two or three Synchronizers may be linked together to simultaneously sample up to 12 to 18 Wave Staffs. The Synchronizers may be configured to free run or sample on command. They are available as a complete unit in a NEMA 4X box or they may be ordered as an OEM version, a PCB assembly. November 2006 - New Ocean Measuring Instrument - Ocean Sensor Systems releases new product 11-1-06. The OSSI-010-008 Wave Staff III is a water level sensor that combines a rugged, sealed, waterproof package, low power microprocessor and a temperature stable, sensing circuit. The Wave Staff III operates from 5.5V to 40VDC and has analog and RS232 serial data outputs. The serial data output string contains the water level & temperatures in ASCII or binary format. The Wave Staff II can be programmed to free run or sample on demand. It is easily programmed via a PC serial port using our Wave Staff Interface Software. The Wave Staff III has two new features. The Coaxial Cable Staff eliminates the need for a separate water ground wire and both Staff & electrical cord are changeable. June 2005 - New Ocean Measuring Instrument - Ocean Sensor Systems releases new product 6-1-05. The new OSSI-010-006 Wave Staff II is a water level sensor that combines a rugged, sealed, waterproof package, low power microprocessor and a temperature stable, sensing circuit. The Wave Staff II operates from 5.5V to 40VDC and has analog and RS232 serial data outputs. The serial data output string contains the water level & temperatures in ASCII or binary format. The Wave Staff II can be programmed to free run or sample on demand. It is easily programmed via a PC serial port using our Wave Staff Interface Software. The Wave Staff II has two new features. The Coaxial Cable Staff eliminates the need for a separate water ground wire and both Staff & electrical cord are changeable. The new OSSI-010-007 Wave Logger II combines the high performance Wave Staff circuit, a Compact Flash Card Data Logger, a rugged waterproof package and 4 C size Alkaline Batteries. A low power microprocessor stores the data on a Flash Card in an ASCII or Binary format with time and date. Then the Card is easily removed and can be read on any PC with a standard Flash Card Reader. The Logger will collect months of continuous data or years of burst data. The Wave Staff circuit is temperature stable providing repeatable measurements to better than 0.1%. The Wave Logger is easily programmed via a PC serial port using our Wave Logger Interface Software Program. The Coaxial Cable Staff eliminates the need for a separate water ground wire and is easily changed. The RF Wave Logger with Internal Antenna is a self logging, self powered Wave Staff with RF Data Transmission. It combines the high performance Wave Staff Circuit, a Compact Flash Card Data Logger, an RF Data Transmission System, a Rugged Waterproof Package and 4 C Size Alkaline Batteries. It has an outdoor range of 400ft. The RF Wave Logger with External Antenna is a self logging, self powered Wave Staff with RF Data Transmission. It combines the high performance Wave Staff Circuit, a Compact Flash Card Data Logger, an RF Data Transmission System, a Rugged Waterproof Package and 4 C Size Alkaline Batteries. It has an 0utdoor range of 7 miles. See the Data Sheet for complete details and features. The Solar Powered RF Wave Logger with External Antenna is a self logging, self powered Wave Staff with RF Data Transmission. It combines the high performance Wave Staff Circuit, a Compact Flash Card Data Logger, an RF Data Transmission System, a Rugged Waterproof Package and 4 C Size Alkaline Batteries. It has an 0utdoor range of 7 miles. 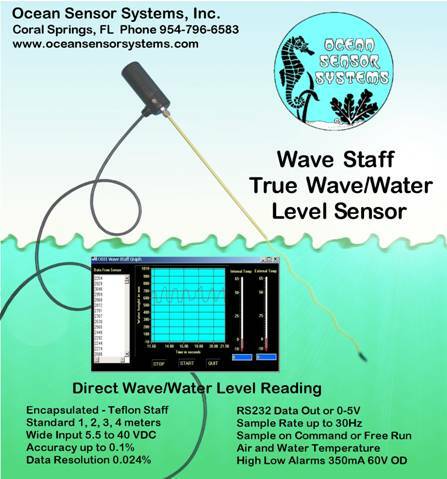 April 2003 - Ocean Sensor Systems releases the new Wave Gauge. A submersible self logging, self powered pressure sensor. We combine a temperature compensated highly stable pressure sensor, a Compact Flash Card Data Logger, a rugged waterproof package and 12 C size Alkaline Batteries to make the ideal submersible Wave and Tide data collecting instrument. Dec 2002 - Ocean Sensor Systems releases the Wave Logger. A self logging, self powered Wave Staff. We combine our high performance Wave Staff circuit, a Compact Flash Card Data Logger, a rugged waterproof package and 4 C size Alkaline Batteries to make the ideal Wave and Tide data collecting instrument. May 2002 - Ocean Sensor Systems is awarded Vessel Traffic Monitoring System Research and Development contract. This contract funds development and testing of a state of the art microcomputer based expert system suitable for a wide variety of applications including traffic surveys and harbor defense systems. This system provides real time internet displays using a secure virtual private network. April 2002 - Ocean Sensor Systems' Wave Staffs were chosen by Waterways Experiment Station, Vicksburg, Mississippi (US Army Corps of Engineers) for testing of their new flume, (the largest in the world), and received rave reviews and continued use in their test facility. Nov. 2001 - Ocean Sensor Systems is awarded a Harbor Brach Oceanographic Institution research grant towards " Identification and Alleviation of Adverse Interactions Associated with Undersea Turbine Operation"
Sept. 2001 - Ocean Sensor Systems received a contract from the U. S. Army's Aberdeen Proving Ground Test Center for Wave Staffs for use on new experimental equipment. May, 2001 - Ocean Sensor Systems is awarded an Office of Naval Research Grant to develop an Innovative Air Sea Interaction Buoy.